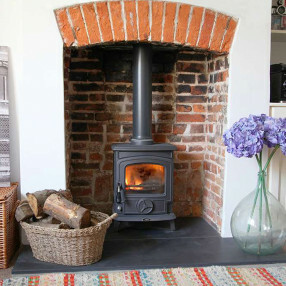 The AGA Little Wenlock is a highly versatile stove with an output to rival larger wood burning stoves. The compact design ensures it will fit easily into smaller fireplace openings, making it ideal for cosy rooms and apartment living. The Little Wenlock combines a contemporary looking clear glass window with traditional moulded detailing, the arched side panels and distinctive wire handle make it a must buy AGA stove.